Zion Market Research has published a new report titled “Plasma Protein Therapeutic Market by Product Type (Coagulation Factors, Immunoglobulin, Alpha-1 Proteinase Inhibitor, and Albumin), by Application (Hemophilia, Primary Immunodeficiency Disorder, Idiopathic Thrombocytopenic Purpura, Secondary Immunodeficiency, Hereditary Angioedema, and Other Indications), and by Region: Global Industry Perspective, Comprehensive Analysis and Forecast, 2017 - 2024”. 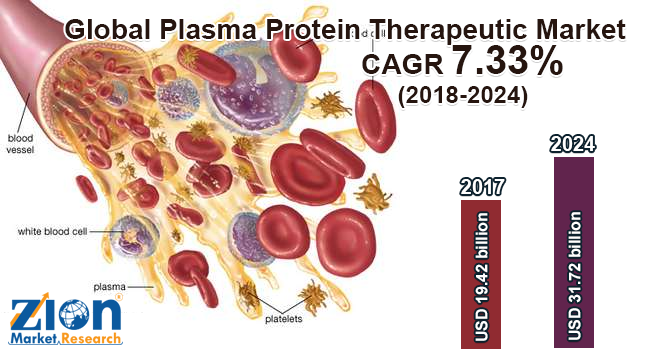 According to the report, global plasma protein therapeutic market was valued at approximately USD 19.42 billion in 2017 and is expected to generate revenue of around USD 31.72 billion by end of 2024, growing at a CAGR of around 7.33% between 2018 and 2024. Plasma can be defined as a clear, straw-colored fluid part of the blood which residue after red platelets, blood cells, white blood cells and other cellular components are eliminated. Various proteins are present in the human blood. A mixture of lipoproteins, simple proteins, glycoprotein’s, and other conjugated proteins are called plasma proteins. Plasma protein therapy is an inimitable biological medicine, it has a biochemical profile because of which it differs in processing and production methods and is used to treat various genetic, life-threatening chronic, and rare diseases. These plasma proteins play a vital function in blood clotting and also provide immunity against diseases. The major driver of global plasma protein therapeutic market is the growing usage of the plasma proteins derived medicines worldwide. Introduction of new plasma-derived therapies is another major driving factor of the market. However, execution of stringent regulatory policies and issues pertaining to reimbursements can create restraints to the plasma protein therapeutic market which may limit the growth of the market. Additionally, present complexity in biologics manufacturing is also expected to create threats for the market. The plasma protein therapeutic is segmented on the basis of product type which is further divided into coagulation factors, immunoglobulin, alpha-1 proteinase inhibitor, and albumin. On the basis of applications, plasma protein therapeutic is segmented as hemophilia, primary immunodeficiency disorder, idiopathic thrombocytopenic purpura, secondary immunodeficiency, hereditary angioedema, and other indications. To enhance the aesthetic beauty and growth in preference for minimally-invasive procedures has increased the demand for the plasma protein therapeutics which majorly drives the market growth. North America, Europe, Latin America, Asia Pacific, and the Middle East & Africa are the important regional segments of the global plasma protein therapeutics market. North America is projected to dominate the global plasma protein therapeutics market due to the increased awareness of people for regular blood donations, high disposable income of the people, and presence of advanced technologies for fractionating procedures Europe is the second largest market in the global plasma protein therapeutics market, due to the sudden increase in the amount of plasma processed and collected in this region. Some of the most lucrative markets for plasma protein therapeutics in Europe include Switzerland, Germany, Spain, Italy, France, Sweden, and the U.K. Asia Pacific is also expected to develop at a considerable rate, showing a promising CAGR during the forecast period, owing to the growing awareness about blood donations. Some of the key players in the plasma protein therapeutic market include Octapharma, CSL limited, Baxter, Telecris, Grifols, LFB Group, Kedrion, and Chengdu Inst; Japan Red Cross, Shanghai Blood Institute, BPL Group, and Sanquin are some of the nonprofit organizations which also are playing an important role in plasma protein therapeutic market.